As a child of a Navy sailor, I lived all over the world when I was young, including Spain, Florida, Puerto Rico, and Mississippi. It wasn’t until I was in sixth grade that my family decided to settle down in Franklin, where both my parents are originally from, and I’ve been here ever since. Upon graduation, I decided to turn my passion of music into a career, and went on to study music therapy with a concentration in voice at Slippery Rock University. Through my program, I not only gained musical skills, but I took psychology classes that taught me how to use music appropriately when helping people. Right out of college, I began my career at Next Step Therapy in Seneca as a music therapist, where I helped children with a variety of special needs, many on the Autism spectrum who are not often able to verbalize their emotions or thoughts. As I practiced music therapy each day, I realized I wanted to do more with it, which led to the creation of my own business—DS Music Therapy. Eventually, I ended up taking a new job as a teacher’s aide with the high school learning support at Valley Grove School District. Although this job does not typically involve my music knowledge, I am able to provide support to students through my therapy background, as well as another skill of mine—math. I still continue to run my business regularly, and I also began teaching music lessons once a week through the Porch Music Store, including voice, guitar, and ukulele. 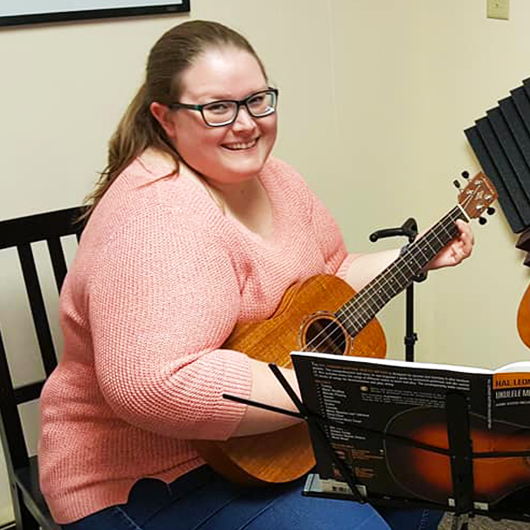 On top of my full-time job, business, and music lessons, I realized I wanted to dive deeper into music therapy, which led to the start of my graduate career at Slippery Rock, where I am studying for my masters of music therapy on the track to earn my license as a professional counselor. The program I am enrolled in is brand new to the university and has made me feel even more connected to music therapy. We explore through theoretical practices as well as self reflection, and learn how to empower people to find strength. I’ve gained so much knowledge about myself though this program, too, in which we’ve touched on topics such as feminism, personal biases, and social justice. I never thought my decision to study music therapy would become what it is today, but I’ve loved where my business and career have taken me. I have found success though many avenues, but overall it’s the community I credit. I can tell that people truly want me to succeed here and word of mouth has been the main driver to my business. My goal is to grow my business and do more with music and workshops throughout the community, including the addition of a studio space in the Porch Music Store, which we opened in April of 2018. My business is a way for me to make a living, but my main goal is to help people and make my therapy a collaborative and resourceful experience. In my free time, I mostly like to relax, because I am often very busy. When I’m looking for something fun to do in the Venango Area, though, I enjoy attending shows at the Barrow-Civic Theatre, grabbing a coffee at Bossa Nova Café Roastery, shopping and eating locally, walking downtown or on the bike trail, and attending and participating in local events, such as the Taste of Talent. I am also helping with the Barrow Theatre Institute, a series of youth workshops at the Barrow-Civic Theatre. The class I’m planning is called Improv-ination and it is focused on strengthening improvisation skills for theatre use; however, it also involves strengthening of self-esteem, using imagination to create or problem solve, and building character. There are so many reasons to call our area home, such as affordability, safety, a relaxing environment, and the overall small town feel, but it’s really the people who keep you here. Between my career, business, and involvement in the community, I love the life I have built here in Venango County.